Russia-backed militants committed five ceasefire violations in the ATO zone yesterday. They used both 120-mm and 82-mm mortars having fired a total of 58 rounds, reported Ukrainian Ministry of Defense spokesman on ATO Colonel Dmytro Hutsylyak at a press briefing at Ukraine Crisis Media Center. In Lunahsk sector, the enemy violated the ceasefire three times. Starting 16:00 and over the following two hours Russian proxies were simultaneously attacking Ukrainian positions near Lozove, Luhanske and Zaitseve with small arms, grenade launchers, and heavy machine guns. Near Luhanske, the militants fired twenty-three 120 and 82-mm mortar rounds. Russia-backed militants also employed IFV mounted weapons and ZU-23-2 antiaircraft gun. Ukrainian troops returned fire using weapons not proscribed under Minsk agreements. In Donetsk sector, Russian proxies attacked Ukrainian positions in Avdiivka and Novotroitske areas. “After 11:00, Russia-backed militants fired twenty-five 82-mm mortar rounds against Ukrainian strongholds near Avdiivka,” elaborated Col. Dmytro Hutsylyak. After 23:00, the militants fired ten 82-mm mortar rounds in Novotroitske area. 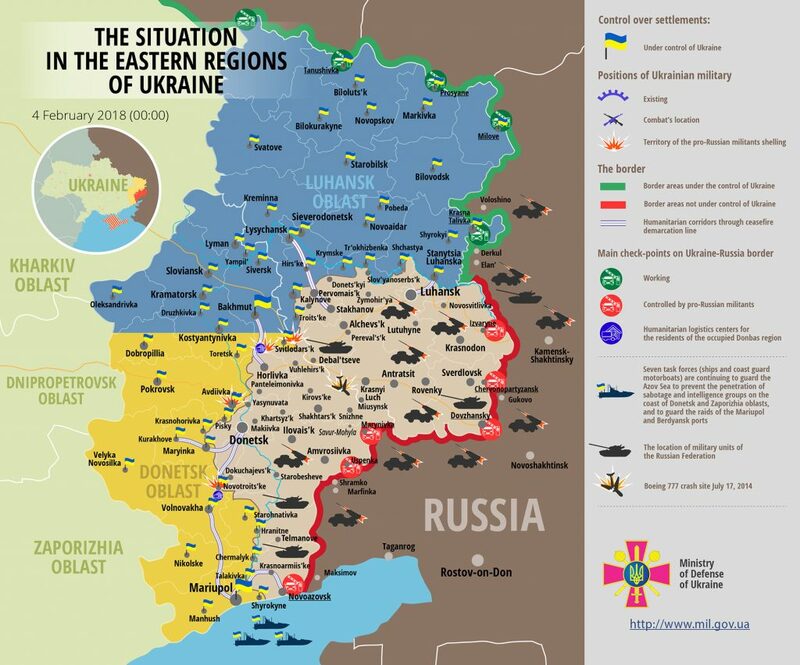 Unfortunately, two Ukrainian servicemen were wounded in action yesterday. Report on the military developments as of February 3 is available here. Interactive data on the shelling: chronology shelling chart and the interactive map.